Jerry Seinfeld in Montreal or Quebec City? Inform me about the next events for Jerry Seinfeld. Enroll yourself to our priority waiting list for Jerry Seinfeld to be alerted when new tickets are available. Filling this form doesn't engage you to any purchase. Jerry Seinfeld is a truth New Yorker he was born and still lives there today. He is an actor, producer and stand up comedian. His name became famous following the series that bears his name and where he was the main character. This serie was on air almost 10 years. 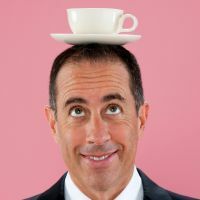 The rumors are intensifying and suggests that Jerry Seinfeld could indeed be presenting his show at the Bell Centre soon. Make sure you register on our priority list to stay tuned on further developpement in the Jerry Seinfeld next visit in town.